Front Bar lifts for Seven, Nine wins Wednesday. 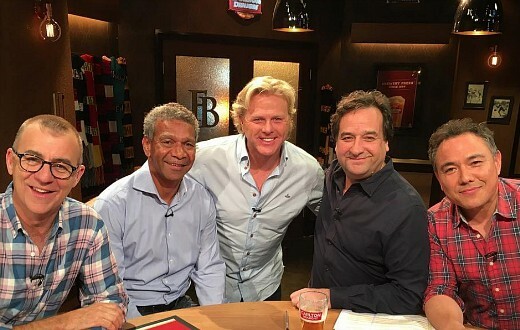 Last night The Front Bar had the AFL audience all to itself in its timeslot and drew a bumper crowd of 401,000. In Melbourne the show was 285,000 which is 100,000 more than Footy Show had when it opted for Tuesday. From 9pm Seven led the night (but Nine still won the evening). Meanwhile it was another Wednesday slug-out between The Block and The Bachelor with Nine regaining glory last night. Nine’s reno show won this time at 980,000 to TEN’s 805,000, the latter down on last week. Anh’s Brush with Fame, 7:30 and Highway Patrol followed. The Weekly was up on last week at 619,000 as it played out against Reality overruns and staggered scheduling in various cities. New ABC comedy Back in Very Small Business debuted to 348,000. SBS was out of luck again with local doco The Employables at a disappointing 108,000. Seven News, ACA and The Chase won as usual. Nine won Wednesday with 28.5% then Seven 27.7%, TEN 20.2%, ABC 16.9% and SBS 6.6%. The Block was best for Nine at 980,000 viewers then Nine News (948,000 / 909,000), A Current Affair (856,000), Hot Seat (461,000 / 246,000) and Bite Club (456,000). Truth & Lies was 145,000. Seven News was #1 for Seven with 996,000 / 969,000 then Home and Away (602,000), The Chase (558,000 / 350,000), Highway Patrol (507,000), Criminal Minds (425,000), The Front Bar (401,000) and Motorbike Cops (350,000 in 3 cities). The Bachelor (805,000) led for TEN followed by The Project (513,000 / 311,000), TEN Eyewitness News (403,000), Pointless (264,000) and movie: Runaway Bride (223,000). ABC News (709,000), Anh’s Brush with Fame (682,000), The Weekly with Charlie Pickering (619,000), 7:30 (595,000) and Back in Very Small Business (348,000). Adam Hills: The Last Leg was 201,000 and Tonightly with Tom Ballard was 105,000 (plus another 55,000 on ABC Comedy). On SBS Great British Railway Journeys drew 263,000 / 258,000 then SBS World News (148,000), The Employables (108,000), Deep State (86,000) and The Chef’s Line (67,000). Noddy Toyland Detective had his fingerprints all over multichannels at 197,000. You know the thought occurred to me while watching The Front Bar that is really a revamped version of a late night talk show, 2 guests and chats in and around them about AFL. Which lead me to think the format would actually work to interview guests from Film, TV and Music like a talk show does and could be a good AFL off-season show. Probably still only as a once week show (maybe twice), as I don’t think we have the have the depth of people to come in and be interviewed to have a 5 night a week one. Mick Molloy is in the industry enough to get guests in, maybe could have different hosts, Julia Zemiro has shown she has the chops via Home Delivery, Sam Pang could still be there however there is the on TV too much thing that could happen (though he and Julia work well together). The Front Bar name could become a franchise type show really. I’m not surprised with Today’s rating. There’s Zero chemistry on set, apart from Karl & Georgie [trying Very hard to like each other – it’s not working], Tim always appears annoyed with Richard. Was better when Ben & Deb filled in a few weeks ago and with the other young guy [forgotten his name] doing sports. They need a whole new line up for 2019! I totally agree with you Dean. Although I also think Sam and Kochie only just tolerate each other too. Sadly TEN seem to have followed 7 and are allowing the bullies to rule on The Bachelor…very disappointing. Can’t remember a time when The Today Show’s numbers were so low, wonder what it was doing during that had period with Jessica Rowe while Eddie McGuire was in charge? Jessica Rowe would lift ratings now. Love her.